Many homeowners believe they do not have to pump their septic tanks because they aren’t having any problems. When you wait for a problem to occur it is likely to cost you more than if you would’ve just had it pumped on a regular basis. Think of your septic system as a garbage can, when it gets full, you empty it. Same goes for a septic tank, they get full and they need to be emptied. All of the water that comes out of your house goes directly into your septic tank. Washing machine, dishwasher, bathrooms, showers, anything that goes down a drain goes into your septic tank. A septic tank is designed to hold water long enough for all the grease and fats to float to the top, and any solids to settle down at the bottom, forming sludge. This sludge does not just disappear. After so many years it begins to build up. If you continue to let it build up and ignore your septic it will either back-up into your house, causing a very unsightly mess which can cost a lot to clean up, or solids will begin to flow out into your drain field eventually ruining it. A pumping costs on average about $300.00, a new drain field costs anywhere from $5,000-$10,000 ! That is equal to about 33 pumps which is more than you would ever need. So no matter what your Grandpa told you about septic systems you DO need to pump them. Depending on how many people live in the house, and how big your tank is you should probably have your tank pumped every 3 years. If you have 5 people in your house and only have a 1200-gallon tank you may want to do it more often, say every 2 years. If there is just one of you then you may be able to go about 5 years. 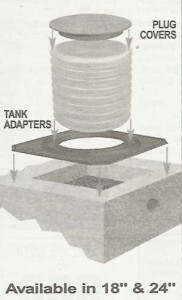 An easy way to tell if you need your tank pumped is by having risers installed to allow for easy access for an inspection. All you would have to do is pop the top and see if the solids and paper materials have built up, if they have, give us a call. Despite what the package may say, some things just shouldn’t be flushed. Baby wipes, baby diapers, grown up wipes, tampons, tampon applicators, dental floss, q-tips, cigarette butts, grease, toys, none of these things should go into your septic tank. Baby wipes and tampons have ruined more drain fields than we can count. We know manufacturers say they are flushable, but they do not break down like organic material. Tampons swell to 10x their size, and easily clog pipes and drain fields. These things were meant to go into the garbage can, please put them there. If you live in the country or outside the city limits most likely you have a septic tank. If you don’t get a monthly sewer bill from the city, most likely you have a septic tank. If you just don’t know, call us, we will come to the house and either find the septic tank or find that you are on city sewer. If you are just buying a house, please ask for a septic inspection. This way you know what you have or what you don’t have. This one time charge for a riser can save you lots of money in the long run. Please feel free to call for more information.